My husband does most of the food shopping in our family, I give him a list of things to buy, and he’s happy to oblige. He does an excellent job usually sticking to my list, but sometimes he gets extras. hunting the prey and triumphantly bringing the hide of a mammoth to his cave to be divided among tribesmen. when no guests were expected and the refrigerator was well stocked. First I thought that I’ll roast the lamb and be done with it, but that’s just too much of the same type of a meal for our family. I decided to make an Uzbekistani plov from some (more on that in another post) and kebabs inspired by the recipe in “Ottolenghi” cookbook. 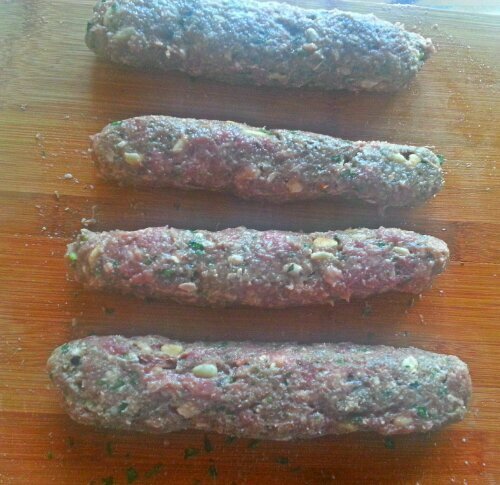 These wonderfully fragrant and earthy lamb kebobs are absolutely delicious. Easy and fast enough to be part of an everyday dinner, and tasty enough to be served at a special event. 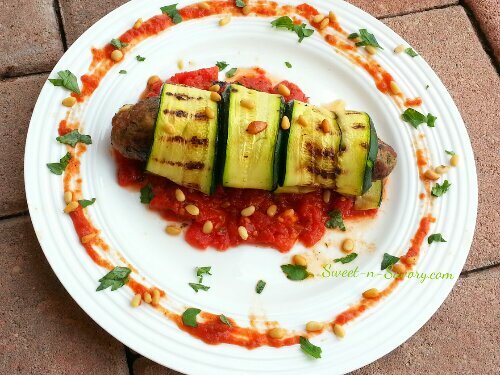 The grilled zucchini add a nice touch, and tomato basil sauce rounds up the flavors. I suggest you make the sauce first. 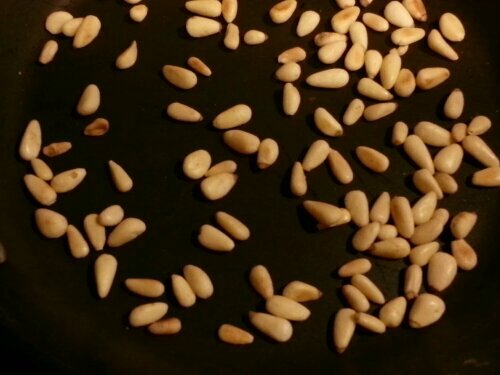 Place olive oil and garlic in a sauce pan an stir on medium low heat until garlic has softened. 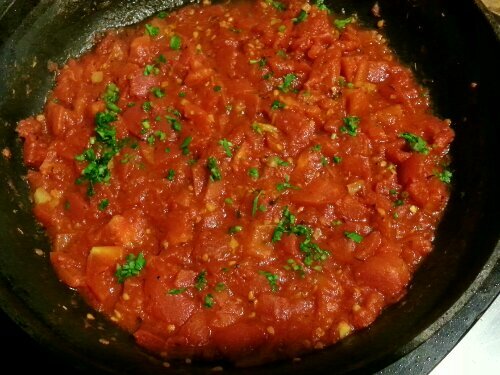 Add tomatoes, salt and pepper flakes stir and cook for about 20-30 minutes until thickened. Adjust the seasonings, add chopped basil leaves and set aside. Meanwhile soak bread in cold water, then drain and squeeze all the water out. Crumble the bread into a large bowl. 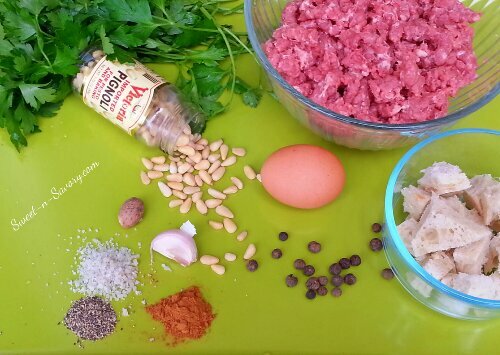 Add ground lamb, egg, garlic, spices, parsley. And mix everything very well together with your hands, make sure not to overmix. 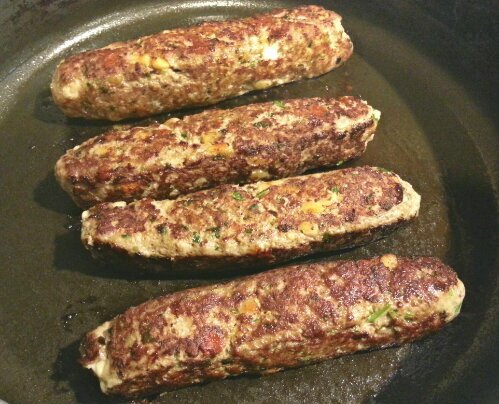 Heat a thin layer of oil in a skillet add the kebabs and sear them on all sides for about 3 -5 minutes. Remive from pan and set aside. 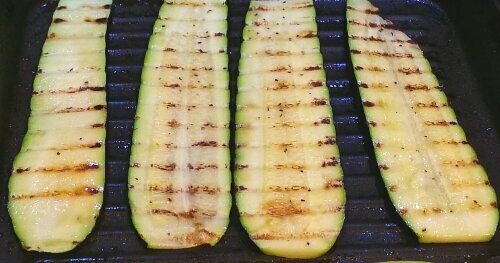 Brush the zucchini slices with a little olive oil on both sides, season with salt and pepper, and grill the slices on a grill pan or broil them until they get soft, but not mushy. 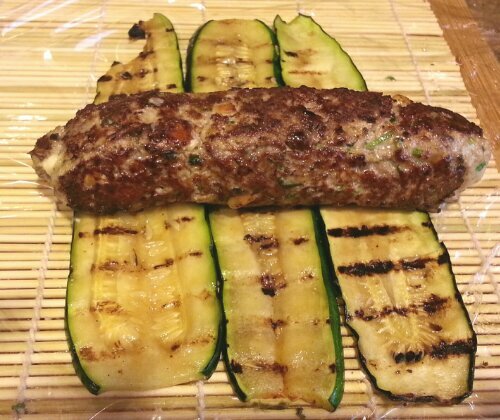 Wrap each kebab in a zucchini slice and place on a cookie sheet seam side down.